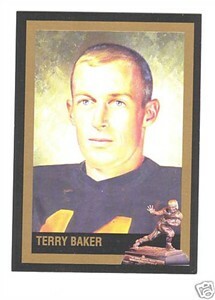 Heisman Trophy winner card of Oregon State quarterback Terry Baker (the first West Coast player to win the award), from the officially licensed Heisman Collection sets of the early 1990s. NrMt-Mt or better. ON BACK ORDER.